Petite Pearl has been productive after winter low temperatures of –32F. Bevens Creek Vineyard and Nursery grows Petite Pearl just west of Minneapolis, MN. In the winter of 2008-2009 our vineyard saw damage on some of our most winter hardy grape varieties. Some of this damage was site related, but also could have occurred due to a dramatic (50F degree) overnight temperature drop in late December. We saw very little damage in 3 year old Petite Pearl, while 4 year vines had no damage from this weather event. Petite Pearl is highly disease resistant to powdery mildew, downey mildew, black rot, and bunch rot. A regular preventative spray program is recommended. Petite Pearl ripens late season in the Minneapolis/St. Paul, MN area. Bevens Creek harvest numbers on September 30, 2008 were TA .7 pH 3.47 Brix 22.8. This excellent ripening was observed after the fifth coolest summer on record in the Minneapolis, MN area. September 30, 2009 harvest numbers were TA .64 pH 3.41 Brix 24.6 after another cool season. Petite Pearl will commonly set three clusters per shoot. Late spring frost damage is less likely due to late spring bud break and bloom. The small compact clusters have large shoulders and small berries (Avg. 96 grams). Thick berry skins provide excellent cluster condition during late season harvest. The berries are highly resistant to bunch rot and split berries. Bevens Creek's 2008 Petite Pearl harvest averaged 13 pounds per vine after cluster thinning to two clusters per shoot in August. Petite Pearl establishes itself quickly in the vineyard with limited cropping in the third year. The moderately vigorous vine has an orderly trailing habit. Very little shoot management is needed when trained to a top wire cordon trellis where fruit is naturally exposed to sunlight. A mature balanced vine has little lateral growth. On rich organic soils you can expect vigorous growth and appropriate trellising and spacing are needed. 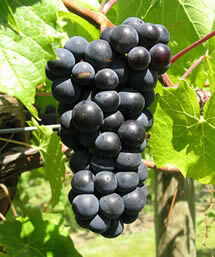 Low acid levels make Petite Pearl ideal for northern red winemaking. It makes a standalone varietal wine and also serves as a valuable blending component. The wine has a dark red garnet color. It shows complexity in aroma and flavor that can be easily shaped by yeast selection and blending. 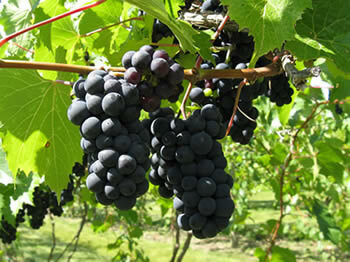 The wine tastes of ripe fruit and has soft mid-mouth tannins. This elegant wine will only improve as more skilled winemakers discover its great potential. A $.80/vine royalty will be added. A non-distribution agreement with Tom is required. A $1.00/vine royalty will be added.